The single "Analogue (All I Want)" was released in the UK on 23 January 2006, on 30 December 2005 in Germany and 30 January 2006 in Norway. The cover of the 2-track UK release features a black and white picture of the band (Morten, Magne, Paul) with some red and grey arty leaf designs towards the bottom of the sleeve. The "a-ha" logo is printed in red on the left hand side with the title in white and silver above. The reverse of the insert is white with red and silver art designs plus track details in black. The disc features a close-up of the red analogue heart with red, white and black flower and leaf designs. In addition to the title track, this CD also include the previously unreleased track "Case Closed On Silver Shore" (4:28). There is also a UK numbered limited edition CD which features the album version of "Analogue (All I Want)", "Minor Key Sonata (Analogue)" (4:34), a live version of "Keeper Of The Flame" from Frognerparken plus the video for "Analogue". The CD comes in a card digi-pak. The front features a black and white shot of the band (Paul, Morten, Magne) with a white border and some red art leaves in the bottom left. The inside of the digi-pak is white with a picture of the red analogue heart with blood vessels. Underneath the clear CD tray is the picture of the band, similar to that on the front of the 2-track CD. The reverse of the digi-pak is silver with red and white art designs and the track list in black. The limited number is printed in the top right. The disc features a close up of the black analogue heart with white, black and red arty flowers and leaves. A very limited edition 7" picture disc is available in the UK and features the same two tracks as the 2-track CD single. The A-side of the picture disc is similar to the cover of the single. The B-side is white with a picture of the red Analogue heart with blood vessels and the track information around the edge. 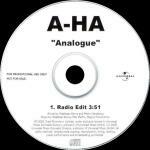 The UK 1-track promo includes the album version of "Analogue". The cover features the red "Analogue" heart, on a white background. The reverse of the insert features a black and white shot of the band (Paul, Morten and Magne" with more of the silver and red leafy art designs at the bottom. Track information is printed inside a silver triangle at the bottom of the sleeve. The disc features a close up of the red heart with white and black arty flower designs. Track information is printed in white at the bottom. "for promotional use only. not for sale" is also printed at the bottom of the disc. Some copies come with a promotional sticker with stats and promotional information about the band and quotes by other artists. Some copies of the UK promo come with an A4 double sided press release with some stats from their career, information about the tour and some of the tracks on the album. Below the text is a colour picture of the album cover and around the outside are some of the red, grey and black arty leaves. IMG WIDTH="150" HEIGHT="130" SRC="singles/analogue.jpg" ALT="Analogue (All I Want)" ALIGN="RIGHT"> The cover of the German release is silver with a red and white art design of a human heart with blood vessels (similar artwork can also be found inside the "Analogue" digi-pak album). The a-ha logo is in red with "Analogue" and "(All I want)" in respectively black and white letters. A white "RTL" sticker with black and red text promotes some of the tracks on the disc. Besides the album version of "Analogue", the limited edition German release also features "Minor Key Sonata (Analogue)" (4:34), a live version of "Analogue (All I want)" from Frognerparken (5:02), the "Instrumental Version" of Analogue (3:48), the previously unreleased track "Case Closed On Silver Shore" (4:28) plus the a-ha desktop player. The disc and inside of the insert are much the same as the UK 1-track promo with close up of the red heart and band shot respectively. The 1-track promo single has a completely different sleeve to the UK promo. The insert is dark brown with some red arty leaves in the bottom left hand corner plus the a-ha logo in red and title in white in the top right. Along the bottom, "for promotional use only. not for sale" is printed in white. The reverse of the cover is of similar design to the front with track information in white down the left hand side. The disc is also brown with red leaves in the bottom left. 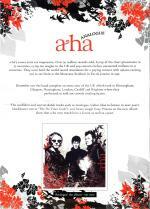 The a-ha logo is printed in red with "Analogue" below in white letters. The text "for promotional use only - not for sale." is printed in white on the top left of the disc. There is another 1-track German promo which comes with a white folded paper insert. 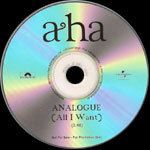 The front of the insert has a large black a-ha logo with the title "Analogue (All I Want)" underneath as well as the Universal logo. The back of the insert has the track and copyright information. 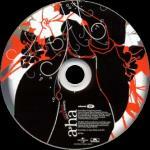 The disc is silver with black a-ha logo at the top and title at the bottom. "Not For Sale - For Promotion Only" is printed at the bottom of the disc with the Polydor and Universal labels on the left and right hand sides respectively. There is a promo edition of "Analogue" with press information sticker from Southern Ireland. It is similar to the UK 1-track promo single. The German 5-track CD single was available in Israel and has a white sticker with black and red text. This German made promo CD-R of "Analogue" is believed to be for the Italian market. It comes with a card insert withe the a-ha logo and title on the front plus track details and German manufacture information on the reverse. 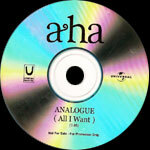 The disc has the a-ha logo printed in large black letters at the top with the title and "Not For Sale - For Promotion Only" printed at the bottom. The Polydor logo is printed on the left hand side whilst the Universal logo is printed on the right. As well as the 4 track CD-single (the same as the German release), there is also a 2-track single available in Norway. The card sleeve and disc are similar in design to the sleeve and disc of the 4-track release. The reverse of the sleeve has additional copyright text in the top right corner, above Magne's head. This edition features "Minor Key Sonata (Analogue)" in addition to the album version of "Analogue (All I Want)". This 1-track promo from Poland features the "Radio Edit" (3:51) of "Analogue". 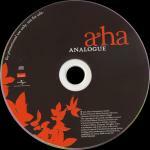 The disc is white with A-HA and "Analogue" printed in black at the top and track details at the bottom. The text "For promotional use only not for sale" is printed on the left hand side. The German promo CD was also used for promotion in Sweden and comes with a white Swedish promo sticker with the album title, website address and information in Swedish. There is an "Ukranian Records" promotional CD-R of "Analogue (All I Want)" which comes without a sleeve(?). 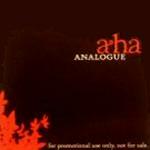 The disc features the a-ha logo in large black letters at the top with the title and text "Not For Sale - For Promotion Only" at the bottom. The Universal logo is printed on the right hand side and the Ukranian Records logo on the left. Southern Ireland promo Analogue [All I Want] Polydor / Universal ALLIWANT1?